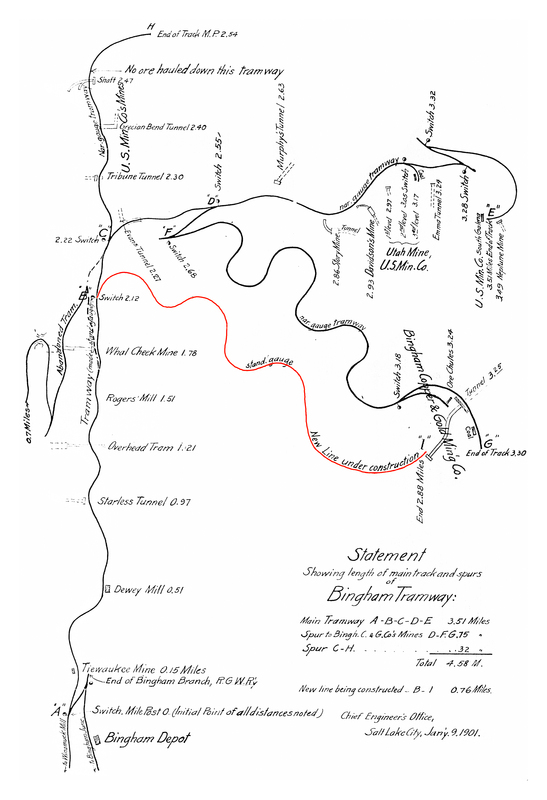 In 1874, a narrow-gauge horse tramway was constructed between the railroad depot at Bingham, and the Jordan mine in Galena Gulch, a distance of 3.5 miles. The grade in Bingham Canyon was too steep to construct a rail line that could use steam locomotives. A horse tramway made use of gravity to move loaded ore cars down from the mine, with men riding the cars and applying brakes to slow the descent. Horses were then used to pull the empty cars back to the mine to be reloaded. Over the years, other "spurs" of the horse tramway were built to serve other mines in upper Bingham Canyon, in Bear Gulch, and in Copper Center Gulch. While the chain of actual ownership of the right of way has not yet been documented, it appears that the railroad (Bingham Canyon & Camp Floyd, then D&RGW, then RGW) retained ownership of the tram, and continued to lease it to a series of operators.